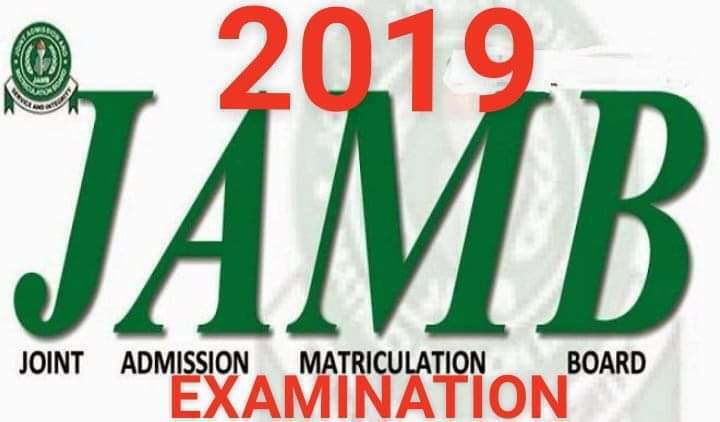 This is all you need to know about JAMB's 2019 Unified Tertiary Matriculation Examination (UTME) and Direct Entry (DE) examination. Applications are invited from suitably qualified candidates for admission to Tertiary Institutions in Nigeria for academic session beginning in 2019. The general entry requirements for admission into the First Degree, National Diploma (ND), National Innovation Diploma (NID) and Nigeria Certificate in Education (NCE) programmes are five (5) O'Level Credit passes including English Language. Details are available in the eBrochure which would be given to each Candidate at the JAMB accredited CBT centres and State-Offices. It is also available for download at www.jamb.gov.ng and on Android Mobile App(JAMB IBASS) from the Google Play store. i. A minimum of O'Level credit pass in five (5) SSCE subjects at not more than two sittings with at least two prescribed subjects [for each programme (course of study)] at Principal or Advanced level. iii. Passes in two major subjects in the NCE with S.S.C.E., NTC/NBC credits or equivalents in THREE other subjects (mainly for Education Courses) and ND. QUALIFICATIONS AWARDED BY EXAMINATION BODIES (IJMB, CAMBRIDGE, WAEC, JUPEB, etc.) APPROVED BY NIGERIA SHALL NOT REQUIRE ANY PREVIOUS JAMB NUMBER. 3.3 CANDIDATES NEED NOT TAKE UTME AND DE AT THE SAME TIME. IF THEY APPLY THROUGH UTME AND LATER OBTAIN DE QUALIFICATION, THEY CAN UPGRADE THEIR UTME TO DE AT NO COST. Every candidate is to note that the 1st choice can be a College of Education, University, Innovation Enterprise Institution, Polytechnic/Monotechnic, Nigerian Defence Academy or the Police Academy. i. One Cell (mobile) number (SIM) can be used by one candidate only. The Cell phone number used for the text message is automatically tied to the Candidate's name and will be used in all communications related to his/her 2019 Application, Examination/Admission. NOTE THE SIM-NUMBER USED. IT IS OF UTMOST IMPORTANCE FOR SUBSEQUENT COMMUNICATION. ii. Candidate sends his/her name [Surname First-Name Middle-Name (if any)] by text (SMS) to 55019. This should be maximum of 38 characters + 2 spaces between names = 40 characters in all to 55019 e.g Tinubu Adamu Odumegwu. Surname and first name are mandatory. iv. Candidate presents the profile code to the point of procurement of form (Banks, MMOs, MFBs, Switches, USSD Partners). The form-ePIN is then sent as text message to the candidate. i. To correct a mistake in candidate's name, send the [CORRECT Surname First-Name Middle-Name] to 55019 as a text message from the same mobile number. For ALL complaints on JAMB processes, candidates can create a support ticket at (support.jamb.gov.ng) with his/her email address registered on the Board's site. The candidate then provides his/her name, phone number and the nature of issue, select a complaint area on a drop down and then summarize the nature of complaint. He/she may also attach supporting documents (if available) then send. ii. Mobile Money Operators: Paga, e-Transact, Pocket Moni, TEASYPay ,Packway Projects (Readycash) and Xpress payment solutions. iii. Participating Micro Finance Banks: Trust MFB, Zazzau MFB, Obeledun MFB and Regent MFB. iv. Online Payment Platforms: System Specs (Remita),InterSwitch (Quickteller) Upper-link, e-Transact and Unified Payment Services (UPS). v. Cooperative Society: JAMB Multi-Purpose Cooperative Society. vi Others: Unique ICT, Digital Partners Network. viii. ATMs of banks listed in 5D (i) above (InterSwitch). ix. USSD (ERCAS) for mobile banking. x. Nigerian Embassies in Abidjan, Accra, Addis Ababa, Beau, Cotonou, Jeddah, Johannesburg, and London. i. Collect the Profile Code from candidate's phone. ii. Collect payment and vend ePIN by SMS to candidate's phone (Not dictating or copying). iii. Facilitate POS Payment, if necessary. iv. Issue Evidence of Payment. v. Collect Centre Service Fees, if requested by the CBT Centre. vi. ePIN is to be delivered electronically to candidates and not to be handwritten. a. Present Profile Code and pay by cash or card. b. ePIN is then delivered to the candidate's unique telephone number. This is available at State Offices of JAMB + CBT Centres, other POS outlets and any CBT Centre that demands it. a. Present Profile Code and pay by card. This is available at CBT Centres and Other Outlets. a. Present Profile Code and pay by cash. This is available on all ATM outlets of Participating Banks listed in 5D (I) (Interswitch Channel). a. Select Bill Payment and then pick JAMB. b. Enter Profile Code and pay. c. ePIN is then delivered to the candidate's unique telephone number. a. Visit JAMB website: www.jamb.gov.ng. b. Click purchase of 2019 Application Document. c. Enter your Profle Code. d. Select payment method (Interswitch, Remita, e-Transact, Unified Payment Solutions, Upper –link or Paga). e. ePIN is then delivered to the candidate's unique telephone number. c. Select bank and follow the prompts to complete payment. d. ePIN is then delivered to the candidate's unique telephone number. a. Registration fee for candidates from the eight foreign countries is $20 or its equivalent in each of the eight countries. b. 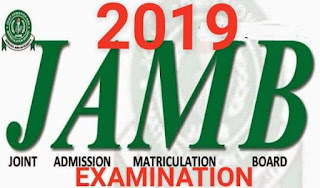 Candidates from the eight foreign countries are to download the Application from the Board's website (www.jamb.gov.ng) complete and summit it with the fee at the eight designated centres as indicated on the website. a. If ePIN is not Received or Lost, send [UTMEPIN] or [DEPIN] to 55019 for UTME or DE respectively from the unique number. a. Only the accredited Computer Based Test Centres and JAMB Offices will be allowed to register candidates. b. Each candidate should visit any accredited CBT centre (the list of accredited centres is on our website (www.jamb.gov.ng), with his/her personal details, the profile and evidence of payment. The candidate PERSONALLY presents the ePIN at any JAMB accredited CBT Centre for validation and completion of registration. The name of the candidate as typed by the candidate on his/her phone when registering the profile comes up automatically on the input of the e-PIN by the CBT centre. i. Pay NOT more than N700 as Service Charge to any of the accredited CBT Centres (Do not accept to leave your particulars for proxy registration. It will disqualify you). ii. Provide Biodata including Date of Birth, Nationality, State of Origin, Local Government, Gender, e-mail address, telephone number, among others ( It is wait and get service). iii. Provide choice of institutions and programmes (course of study). iv. Provide qualification with grades and dates, if not awaiting result. v. Upload relevant certificates, if not awaiting result (this is applicable for both UTME and Direct Entry (DE) candidates. vi. O/L and or A/L grades are to be provided by candidates. Candidates who are awaiting results should supply (upload) the results online on CAPS (JAMB) as soon as they are available on JAMB's portal. No recommendations from any Institution will be considered by JAMB if the candidate has not uploaded his/her result on the portal of JAMB. vii. Supply JAMB registration number for previous institutional certificates for DE only. b. Examination for UTME (actual examination). ix. Do picture capture (no scanning of passport photograph). x. Do Biometric enrolment (ten fingers). xi. Review entries and confirm correctness. xii. Print Registration Slip USING BIOMETRIC AUTHENTICATION to confirm valid finger-print (UTME/DE). Note that authentication with your thumb removes blames of error from the CBT operators. Check before you confirm with your thumb. xiii. Collect, at no other cost, the reading text and CD. xiv. Each Candidate is to collect his/her e-slip at the end of registration as evidence of registration. xv. There will be no offline registration, as all the accredited CBT centres have been empowered for real time online registration. No candidate should register at any centre other than the accredited CBT centre and JAMB State-Offices. Any candidate who is registered outside approved centres will be identified and disqualified. A special indicator for the deaf/mute has been created to differentiate them for special attention at the examination hall. Deaf candidates are therefore to confirm this appropriately during registration. ii. No other CBT centre is allowed to register such candidates. iii. They will also sit for their examination at JAMB headquarters in Abuja. 6.1 The 2019 CBT EXAMINATION will commence on Saturday, 16th March and end on Saturday, 23rd March, 2019. 6.2 The venue of the examination will be at any centre in the candidate's chosen examination town(s). 7.1 Registration Fee is Three Thousand Five Hundred (N3, 500) Naira Only. Additional Five Hundred (N500) Naira only is paid to obtain the reading text “Sweet Sixteen” by Bolaji Abdullahi for UTME Candidates and “The Last Days at Forcados High School” by A. H. Mohammed for DE Candidates and $20 for Candidates from the eight foreign centres. 7.2 A CD containing JAMB eSyllabus, eBrochure and other vital materials is also given free. 7.3 Candidates should note that ePINS purchased are tied to individual profile and are not transferrable. 7.4 Candidates are advised to keep as private and confidential their security details such as registration numbers, password/numbers of ATM Cards, email addresses and ePINs. No centre is allowed to request for or accept a candidate's password. 8.3 Non-JAMB CBT Centres are allowed to collect, through their bank accounts, a separate Seven Hundred Naira (₦700) only, for mock exercise from only interested candidate(s) after notification of centre has been received by the candidate(s).The payment for mock examination by the candidate shall be made to the centre to which the candidate is assigned after the notification of assigned centres for the mock examination. No Association or body is permitted to run any mock examination on behalf of JAMB. Do not pay for mock until JAMB assigns you to a CBT centre. No one should patronise fraudsters. only JAMB accredited centres can do valid registration and serve as examination centre. 9. 1 All candidates must mandatorily register their profiles through text messages as illustrated above before proceeding to buy the ePIN. 9.2 Registration fee is non-refundable. 9.5 Candidates are advised to read and understand the guidelines on admission and instructions on how to complete the online registration before commencing the process of registration. 9.6 Multiple registrations are not allowed. Candidates who register more than once will be identified and disqualified. 9.7 Candidates should note that they are required to be present and take live photograph which will be embossed on their result slips and admission letters. No scanned/stapled passport photograph is allowed. 9.9 Candidates/Officials would not be allowed to enter into the examination centre with earpiece, wristwatches, mobile phones, electronic devices, or any pen/biro. Only common pencil is allowed. 9.10 Candidates are warned that the Board does not require nor authorise the services of ANY cyber café or establishment other than the accredited CBT centres for this exercise.